I’ve touched before on Wild Turkey Kentucky Spirit’s wildcard status. By “wildcard,” I’m referring to where it lands on the profile/value spectrum. It’s not so much about variance or quality, but about paying a premium for a profile you expect to be special – a cut above. In truth, any single barrel straight whiskey has wildcard potential, it just seems to happen more with Kentucky Spirit than with other Wild Turkey whiskeys in the same price tier. But what if you could use that wildcard reputation to your advantage – maybe walk away with a few ace cards instead? You’re probably thinking this is the part where I go into the whole “private select talk.” While certainly not a bad option nowadays, I’ve yet to have many Kentucky Spirit private selects with dominant “throwback” notes. 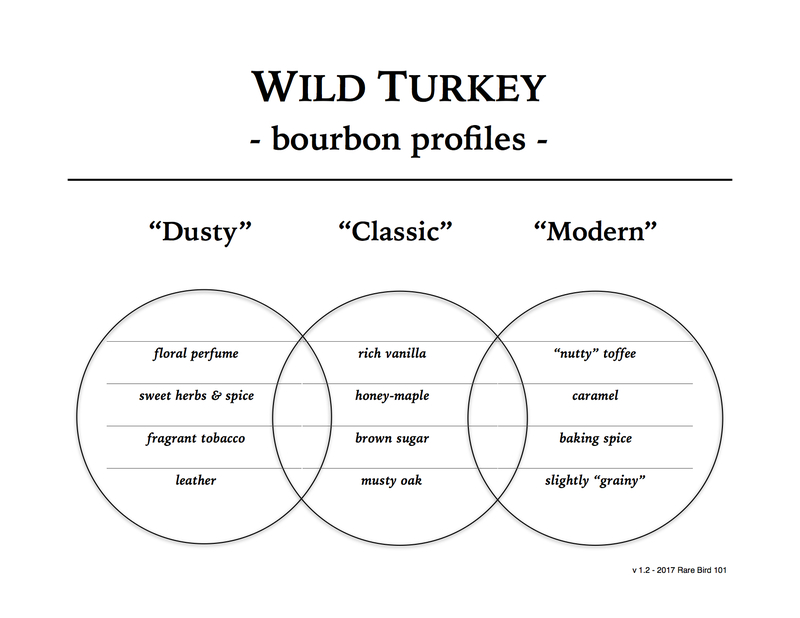 Most are of modern profile (see profile chart) with supportive, yet notable, classic Wild Turkey notes. So, current private selects can be winners, but there’s still a decent chance you’ll end up with a single barrel version of Wild Turkey 101. WT 101 is a fine bourbon whiskey – no doubt – but why pay a premium to sip it? What I’m getting to is pretty simple and (with a little luck) obtainable within reasonable time and effort. If you’re an avid dusty hunter, I’m preaching to the choir. But if you’re a novice whiskey enthusiast or casual Wild Turkey fan, read this carefully: dates matter. To get started, all you’ll need to do is visit a few bottle shops that carry Wild Turkey Kentucky Spirit. Start local. Check each bottle neck for its fill date (if you’re unfamiliar with WTKS, the dates are always handwritten). What you’re looking for are bottles dated before 2012. Since barrel entry-proof was changed from 107 to 110 in 2004, and WTKS is rumored to be at least eight years of age, then bottles filled 2011 or earlier will typically be of classic Wild Turkey profile. You probably won’t have much luck finding bottles dated prior to 2007, as those have the older full-color label with dark wood stoppers (and even further back, pewter stoppers). But virtually the same WTKS label and cork from 2007 remains in-use as of mid-2017. Thanks to Kentucky Spirit’s wildcard status, many older bottles simply sit in “label camouflage” (often far back in a row collecting dust). A great example of one such discovery is the Kentucky Spirit I’m reviewing today. This bottle was found (with several others of similar date) on a retail shelf in an average wine & spirits store. Speaking of which, I’d like to say thank you to a fellow whiskey enthusiast for the find. So, how will it measure up to the other pre-2012 WTKS I’ve had? There’s only one way to find out. It’s time for a pour! Overall: This is exactly what I expect from a mid/late-2000’s Kentucky Spirit – a throwback classic Wild Turkey profile with a sprinkle of dusty complexity. There’s a fairly dominant orange/fruity vibe that reminds me heavily of Master’s Keep Decades, though Decades has a little more “omph” in my opinion. The nose is very reminiscent of mid 1990’s WT – particularly the leather and clove. There’s a slight dip in complexity when this whiskey hits the palate and the core bourbon notes take over, but the length and flavor of the finish more than make up for it. While not quite the level of a mid-90’s “Pewter Top” Kentucky Spirit, this 2008 is considerably ahead of the average WTKS being released today and lines up well with the 2007 and 2009 bottles I’ve reviewed. All in all, it’s a fantastic bourbon whiskey and an amazing value at retail price. As for a grade, let’s just say that this Kentucky Spirit lives on the border of solid and spectacular.